The New Jersey Devils have started the season off with a 2-0-0 record. While they won games against two teams that combined for a 0-3-2 record so far this year, it is just good for the Devils fans to see a win or two after last season's dreadful start. So the Devils fans are in a good camp right now, despite the big challenge the team will face tomorrow against the Tampa Bay Lightning. Before we look at anything else, let's talk about what the situation is and how we got there. Adam Larsson was selected 4th overall in the 2011 NHL Entry Draft by New Jersey, after they won the draft lottery that year (Because the Devils were 9th overall in the league at the draft, the highest they could have picked with the lottery win was 4th place). There were questions as to whether he should jump right into the NHL or go back to the Swedish league to develop some more. Remember, at the time, he was only 18 years old. Before he was even drafted there were whisperings of "Lidstrom" and "Niedermayer" surrounding him, which has resulted in a tremendous amount of pressure on his career development. After a stellar showing at training camp, Larsson made the Devils team that same year, where he tallied 18 points (2G 16A) in 65 games. Unfortunately for Larsson, 65 games is the highest number of games played in a single NHL season for his career. This is where things get a bit hairy for Adam. Perhaps it was an injury sustained by a massive hit by PK Subban, or a series of benchings for seemingly trivial errors, or maybe being sat in favor of 7th d-man, Peter Harrold on multiple occasions, but something seemed off about Larsson's development. Were people getting impatient with him? Was he being mismanaged? Was he just not panning out as a prospect? All are possible options. Over the summer, there were a series of roster moves which seemingly benefited Larsson. These moves included using a compliance buyout on defenseman Anton Volchenkov, the UFA defenseman Mark Fayne signing a contract in Edmonton, and the new assistant head coach (after Scott Stevens stepped down), Tommy Albelin, who is supposedly a big supporter of Larsson. On top of all that, Larsson and the Devils agreed to a 1-year, $900K "prove it" contract for the upcoming season. Insert Jon Merrill, new-coming defenseman that's been on top of the Devils prospect boards since his drafting in the 2nd round of the 2010 NHL Entry draft. Merrill played 52 games in his first NHL season with the Devils last year. Despite two upper-body/head injuries, Merrill really proved himself as a staple on the blue line for years to come. Merrill had a Corsi For% of 53.4%, which was pretty solid for a rookie defenseman. Finally, with Larsson's spot to take on this year's roster, insert Damon Severson. The 20 year old defenseman was drafted in the 2nd round of the 2012 NHL Entry Draft and put up some amazing numbers in juniors. Last regular season, he had 61 points (15G 46A) in 64 games played. For those who don't know, a point per game rate is absolutely incredible for a defenseman. (He had over a ppg in the playoffs that year, scoring 18 points in 14 games.) So there was a lot of hype surrounding the potential offensive side, as well as the overall side to Severson's game. Severson was invited to Devils rookie camp this off-season to play with other prospects including Stefan Matteau and Reid Boucher. Severson impressed the coaching staff enough to get a spot at the team's training camp. Severson had a phenomenal training camp and pre-season, ultimately snatching the spot in the lineup from right under Larsson. Was I expecting Severson to come into camp and take Larsson's roster spot? No, absolutely not. Heck, I don't even know if anybody predicted that. I, like most others, thought Severson should spend the first year of his professional debut in Albany to better tune his skills to a bigger game. Nope. He proved me wrong by starting out in the team's season opener at Philadelphia. While he didn't get on the scoreboard, I was quite impressed by his positioning and confidence. Meanwhile, on the other side of the glass, Adam Larsson took the healthy scratch pretty hard. "I don't really want a reason," he said, "All that matters for me is if I'm in or I'm out." Larsson continued on to say that this was the most difficult scratch he's endured. Damon Severson solidified his presence in the second game of the season where he registered a goal and an assist against the Florida Panthers (his first NHL point and goal), and it looks like Larsson will be a scratch again in the next game against the Tampa Bay Lightning. So what do you do in this situation? Is it even an issue? I mean the team is winning, and in New Jersey, the team is more important than anything else (the logo on the front of the jersey is more important than the name on the back). From a managerial perspective, you don't want to worry about wasting a 4th overall draft pick, and no coach wants to ruin a young player's development, despite the amount of flack PDB gets from Devils fans. I was watching the Devils second game against Florida when the announcers (Steve C and Ken D) did a talking segment about the issue that Larsson is facing and Ken Daneyko (one of the 3 numbers retired for the Devils, known as "Mr. Devil", and one of the best defensemen the franchise has seen) gave a really good insight into what happened to him early on in his career. Daneyko was a 1st round draft selection by the then, unnamed New Jersey Devils, in 1982. He started his career in the NHL and had suffered an injury, resulting in him missing a lot of games, and ended up having him be a healthy scratch on many nights after his return from injury. For the next two years or so (the first 3 years total of his career), Daneyko was swapped between the AHL and the NHL quite a bit of times. However, once a spot opened up for him on the NHL team, full-time he seized his opportunity, and the rest is in the record books (franchise record 1283 career games). I understand it's been a really frustrating couple of years for Larsson, especially with all the hype behind him before and directly after his NHL draft, but I think it's important for him to realize that his time will come. Remember, he's still only 21 years old. I don't mean to keep pointing to "the next year", but there are two potential openings on the blue line for the Devils next year, as Marek Zidlicky and Bryce Salvador's contracts are ending, and it is questionable as to whether or not they will be re-signed. For a while, Adam Larsson was compared to the defenseman, Victor Hedman of the Tampa Bay Lightning. Hedman was drafted 2nd overall by Tampa Bay in the 2009 NHL Entry Draft, and never quite lived up to his full potential in the early years of his play. However, 6 years after his drafting, Hedman has been on fire. In his last 16 games, Hedman has scored 17 points (5G 12A), and that's not even including how well he's playing tonight against Montreal. Hedman is 23 years old. I think any talks of trading Larsson should be stopped immediately. Not only does Larsson have a tremendous number of years of talent ahead of him, but at this point his trade value has decreased a good amount since his entrance into the league. 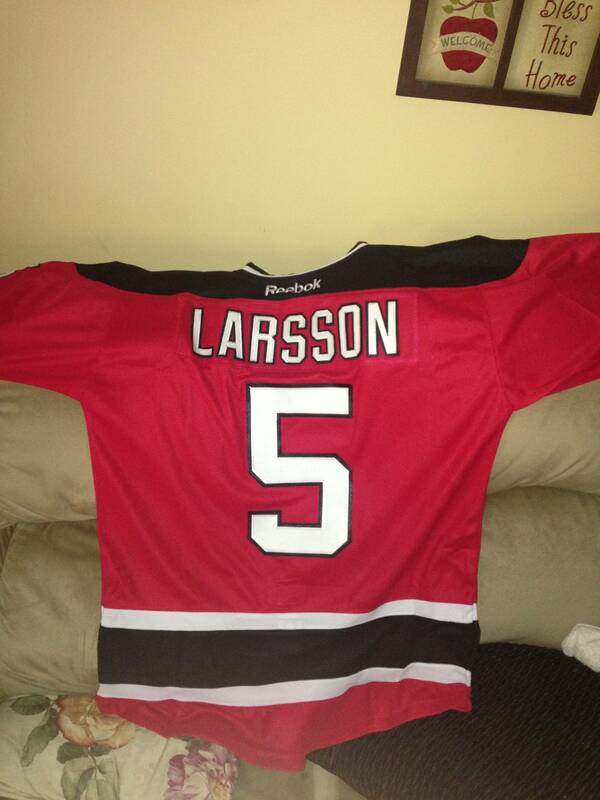 I don't think Larsson will be traded...in addition, I hope he doesn't get traded. It is important to note that the defensive roster the Devils are currently icing will not stay the same for all 82 games this season. Unfortunately there will most likely be an injury, or there will be a regression of talent of a young defenseman (if Severson doesn't regress from his current form, he will win the Calder trophy). Larsson will get his chance to play, and he will have to capitalize on his chances, much like Daneyko. We don't know what the season will look like for Larsson, the young defensemen on the team, or the Devils team for that matter. I think in the case of Larsson, patience is required on all sides of the issue, as defensemen take a long time to develop into steady NHL presences. Larsson will have to give reason this season as to why the Devils should extend his contract, and an almost guaranteed (emphasis on almost) will be open for his taking for next season. However, with defensive prospects like Seth Helgeson, Joshua Jacobs, Steve Santini, and Reece Scarlett, the competition will be absolutely fierce. As I mentioned before, I cannot emphasize enough the importance of patience for both parties. The good news is that even though Larsson's contract is only for 1 year, he is still a RFA after the end of the current contract. I still think Larsson's potential is through the roof as a top-pairing, elite defenseman in today's NHL. By god, he's still only 21 years old. He will get the chance to prove himself this season, and I really hope he does. Above all else, though, the team is doing well. What do you think about Adam Larsson's situation and future with the Devils? If you want more, follow me on Twitter @DTJ_AHockeyBlog!